Details is a home in North Scottsdale. The project was given that name because of the immense amount of time spent on the small details of a home that are often over looked. From unique tile transitions, to see-through doors that double as a ladder, there was a lot of thought poured into every aspect in effort to make them as functional as they are unique. uploaded Details through Add A Home. 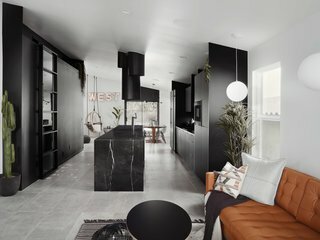 “We removed all the walls and defined the kitchen in the open space with black finishes,” says designer Anthony W Designs. Details's all-black kitchen features a 16-foot-long marble counter and cabinetry by Lignum Cabinets. The 16 foot marble island features marble inlaid on the floor and a cooktop with cylinder venting and lighting. Cabinetry by Lignum Cabinets. The entire functional kitchen wall created by Lignum Cabinets is made from laminate, and features peg-board-like shelving above the sink allowing them to be customized to needs. The custom sliding laundry room door by Dotzler Designs was made from glass and steel to allow natural light into the laundry room, and doubles as a ladder to access storage space above. The second living and dining space. Televisions were mounted flush into the wall. The doors were given custom full-height trim. Dining Space featuring a William Franevsky table and Maps by Copperstate Collection. A hall light detail that discretely illuminates the floor of the black hallway. The floating drain-less custom sink with led backlighting with matching corner shelves by Compound Concrete. Paired with hanging mirror and pendant outlet. The 8-foot drain-less sink by Compound Concrete which waterfalls into the linear shower drain. They also created custom corner shelves which act as a footrest, a shelf, and the top one is actually a waterfall shower head. The custom sliding bathroom door by Dotzler Design was made to disappear into the black wrap-around headboard of the bed. The master shower features an Ipe shower floor/bench and the vanity has cabinetry by Lignum Cabinets with custom open shelving that extends into the shower. The master tub with custom canopy-less pendants. Vanity by Lignum Cabinets.